What can the herpesvirus teach us about oral inflammation? A $2 million grant from the National Institutes of Health will help University of Illinois at Chicago researchers study how herpesviruses, and their underlying molecular mechanisms, contribute to increased inflammation in oral diseases, like periodontitis. The researchers, led by the UIC College of Dentistry’s Afsar Naqvi, will also study how manipulating the small molecules that help to regulate gene expression in the herpesvirus may aid health care professionals to diagnose and treat oral diseases. 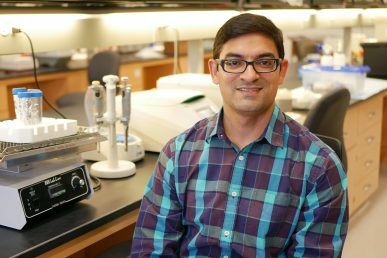 “Herpesviruses are unique in both their lifelong persistence in the human body and in their ability to encode viral microRNAs that not only alter their own genetic activities but their host cells’ functions as well,” said Naqvi, assistant professor of periodontics. MicroRNAs are small molecules in cells that help to control how genes are expressed. Naqvi and his team will study the impact of the five most common herpesviruses associated with oral inflammatory diseases and quantify their microRNA and genome levels. “We want to identify the microRNAs that change when the tissue around the teeth becomes inflamed,” Naqvi said. The funding, which was awarded in July, will support this research for five years, during which time the researchers hope to uncover whether or not viral microRNA can be used as a biomarker to identify patients who may be more prone to oral inflammation and influence treatment decisions toward better outcomes. The research team will also investigate the molecular and cellular mechanisms through which disease-associated herpesvirus microRNAs dysregulate host immune cell functions. “Understanding the way herpesvirus microRNAs affect oral inflammation may also help us develop better therapies and drug targets for common inflammatory conditions, not limited to those in the mouth, like periodontitis,” Naqvi said. Working with Naqvi on this research are UIC’s Deepak Shukla, the Marion H. Schenk Esq. Professor of Ophthalmology, and Salvador Nares, associate professor and head of periodontics research.